Bullies who once cornered their victims on the playground are now tormenting them in cyberspace. For schoolyard menaces, e-mail messages and Web sites have increasingly become vehicles to threaten, tease, and humiliate other students. Experts worry that such situations—dubbed "cyberbullying"—are just as hurtful as other types of bullying, yet are less likely to be detected or prevented by grown-ups. "Anyplace where you have a school where kids are technologically savvy, you'll see these kinds of behaviors moving in these arenas," said Sherryll Kraizer, the executive director of the Denver-based Coalition for Children, a nonprofit group that works to prevent bullying. The incidents "are vastly more skewed toward girls," she added, because girls are more likely than boys to communicate regularly by technology such as e-mail and "instant messaging." 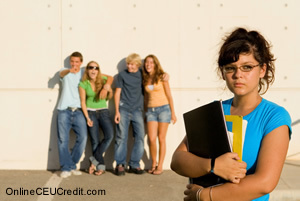 While little, if any, research is available on the incidence of cy-berbullying, anecdotal evidence suggests it is a growing problem in middle- and upper-middle-class communities, especially in grades 6, 7, and 8. "We have seen several cases of cyberbullying at our middle school," said Mary Culin, the drug-prevention and safety coordinator for Arizona's 61,000-student Tucson Unified School District. "In one case, a girl wrote a poem about another girl in which she made hurtful remarks, comparing her to a cow and making fun of her because of the large size of her breasts. She ended the e-mail with a threat." The case was handed to law-enforcement officials, Ms. Culin said. Such problems are occurring overseas as well. United Kingdom researchers have found that one in four children there have been bullied or threatened via computer or telephone, according to a study released last spring by the NCH, a London-based charity. "Children as young as 11 are being faced with taunts or threats from an often-anonymous source," John Carr, the associate director of the organization's Children and Technology United, said in a statement. "They're either not telling anyone and suffering in silence, or are confiding in people who themselves don't know how to deal with it effectively." Cyberbullying takes several forms: One student sends a threatening e-mail to another, then forwards it to additional people; several students log on to America Online's Instant Messenger simultaneously and "slam" another; bullies set up derogatory Web sites dedicated to one or more victims. In the case of "IM-ing," subscribers can have a real-time conversation. While such actions often take place in private homes in the evenings and on weekends, the fallout happens during the school day, leaving teachers and administrators to clean up the mess. "Almost every day, there are a couple of kids who come to school upset, angry, or hurt because of some -thing said to them or about them over e-mail," said Marilyn Long, a counselor at Urbandale Middle School in Des Moines, Iowa. "We can't intervene, and we can't supervise what's going on. All we can do is provide a place for them to talk it out." Twelve-year-old "Rebecca" was victimized by a cyberbully who impersonated her for more than a month on e-mail and the Internet, writing half a dozen cruel messages and creating two Web sites in the girl's name that slandered a friend. Rebecca, then 11, was ostracized by her peers, which led to nights of tears and anger that still surface a year later. "The popular girls were already making fun of me, and I didn't need any more," said Rebecca, tugging on a hot-pink T-shirt embroidered with a kitten, during a recent interview. "It really hurt me." Rebecca's parents, who asked that her name be changed for this article, discussed the matter with the other victim's family, who continued to place blame on Rebecca. They then spoke with the father of the suspected bully, a fellow 6th grade girl whom Rebecca perceived as trying to gain favor with Rebecca's estranged friend, said Phyllis Stanger, Rebecca's mother. Ms. Stanger and her husband also got in touch with the police, AOL, and the Web site provider that posted the pages. Neither the police nor AOL, which provided e-mail services to Rebecca and her family, said they could help, Ms. Stanger said, as the incident was neither a crime nor sent via an AOL subscriber. The Web sites were taken down, she said, but the company that provided the Web template declined to give the family the name of the individual who had set it up. At the same time, Rebecca's parents requested help from the school guidance counselor. The counselor asked Rebecca, the other victim, and Rebecca's alleged impostor to meet, which led to "a fragile truce," Ms. Stanger said. "It just broke my heart because someone was framing her," said Ms. Stanger, a former 5th grade teacher who now provides professional development for teachers. "It was an entirely new level of cruelty." Today, Rebecca and her friend have repaired their relationship. They even exchanged holiday gifts. Cyberbullying, like other forms of bullying, is extremely harmful—and likely to be on the rise, experts say. "There's this anonymity that goes with just typing something into the computer, so I think it is leading to more kids saying unkind things to each other and gossiping," said Ms. Long, the guidance counselor from Des Moines. "Those are typical teenage activities, but it happens faster, and there's less reading of facial expression, so it seems harsher." Seventy-four percent of the 17 million teenagers who surfed the Internet in 2000 used AOL'S Instant Messenger, according to a report conducted by the Washing-ton-based Pew Internet & American Life Project, released last summer. The nonpartisan organization probes the Internet's effect on children and families. "While most instant messages are innocuous chit-chat, many are socially potent," says the report, "Teenage Life Online: The Rise of the Instant-Message Generation and the Internet's Impact on Friendships and Family Relationships." "More than one-third of teens use IM to say things they don't want to say in face-to-face conversations with their peers," it notes. "Almost a fifth have used IM to ask someone out, and more than a tenth have used IM to break up with someone." School administrators say a majority, if not all, of those exchanges take place in private homes, which makes such situations difficult for schools to monitor. The gossip mills churned at the 560-student Woodworth Middle School in Fond du Lac, Wis., upon the posting of an Internet "hit list" three years ago that included the names of about 60 students, said Principal Michael G. Nault. Four days passed before administrators solved the case, he said. The two boys, both freshmen, were arrested by local police for disorderly conduct and expelled for the entire school year, Mr. Nault said. They were required to bring notes upon their return from mental-health professionals certifying they were no longer a danger to themselves or others. Thirty-three states require or recommend that districts undertake programs designed to prevent bullying, according to an analysis conducted by Education Week for Quality Counts 2003, which was released last month. Moreover, it is generally assumed that districts' anti-bullying policies cover all forms of cyber harassment, said Christopher Wolf, a lawyer who advises K-12 schools on Internet policy for Proskauwer Rose, a New York City-based firm. And, the laws that apply outside of cyberspace regarding hate crimes and criminal threats must be heeded online as well, said David Friedman, the director of the Washington office of the Anti-Defamation League. While parents are uniquely positioned to monitor their children's computer activities, child-safety advocates suggest that schools provide forums for character education to help prevent harassment. "The school is the one place that has all kids together," said Ms. Kraizer of the Coalition for Children. "It really is the best venue for shaping new behavior." The preceding section contained information about new breed of bullies who torment their peers on the internet. Write three case study examples regarding how you might use the content of this section in your practice. According to the report "Teenage Life Online: The Rise of the Instant-Message Generation and the Internet's Impact on Friendships and Family Relationships," what fraction of teens use IM to say things they don’t want to say in face-to-face conversations with their peers? Record the letter of the correct answer the Answer Booklet. Today's commentaries on bullying in schools come from Ann Mausbach, Kim Morrison, Signe Whitson, Sandy Harris, Julie Combs, and Stacey Edmonson, Dr. Elizabeth Englander, Tamara Fyke, Stuart Ablon and Alisha Pollastri. The new question of the week is: How can teachers and administrators best address bullying in school? Martha Caldwell, Oman Frame, Terry Roller, Dr. Kris Felicello, John Seborowski, Jessica Hannigan, John Hannigan and Kelly Wickham Hurst share their suggestions for combating bullying.